Coyote Buttes South does not have a famous highlight like the Wave but it is more of an adventure. For starters, you have to work at getting there. Access is by a remote network of high-clearance, four-wheel drive roads. There are no hiking trails or routes once you get there. You spot something interesting, walk towards it, and explore. You may not encounter any other hikers once you leave the parking area. Contrast this with the Wave hike where access to the trailhead is quick and easy under normal conditions. With the nice BLM brochure showing a map and numerous landmark photos, you can hardly get lost. And all of the day’s visitors are essentially concentrated on one hiking route. Gorgeous scenery but a different kind of experience. We showed up in January at the BLM field office in Kanab, Utah, holding permits for both the Wave hike and Coyote Buttes South on consecutive days. Obviously, there are reasons that winter permits are easier to obtain. The BLM agent informs us that after a major snowstorm and a week of very warm weather, the main access road (House Rock Valley Road) to the Wave trailhead is a muddy quagmire. Three vehicles had slid off the road the previous day. 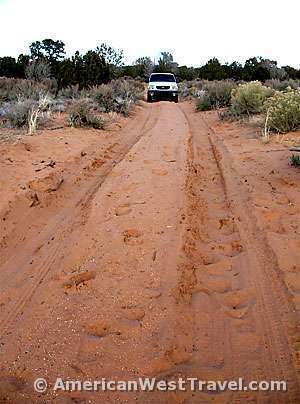 Conversely, the conditions for accessing Coyotes Buttes South are improved with damp conditions. During most of the year the network of high-clearance, four-wheel drive roads can be difficult sand traps. The extra moisture packs the sand and makes driving easier. We are scheduled for South Coyote for the first day and will go through with this trip, then check out the driving conditions to Coyote Buttes North the following day. We decide to access the area from the south via Jacob Lake and Highway 89-A. The lower end of House Rock Valley Road (BLM-1065) goes through much more open, drier terrain at lower elevation, making muddy conditions less likely. 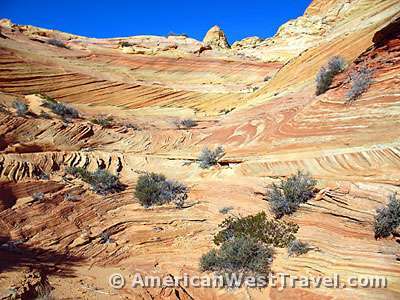 It is also very convenient to the easiest road access (BLM-1017) into Coyote Buttes South. 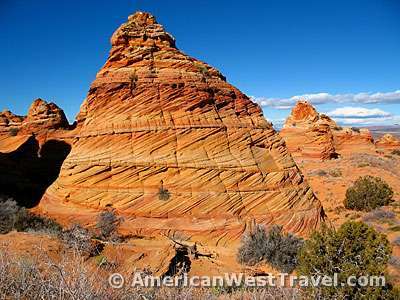 There are two main access points into Coyote Buttes South: Paw Hole on the southern tip, and Cottonwood Cove on the remote east side which is considered the more scenic area. 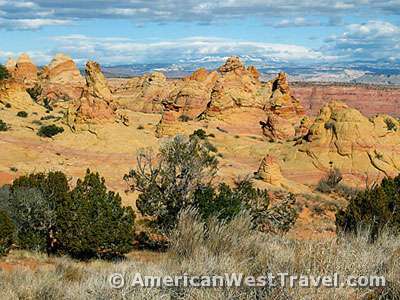 The area is noted for the Cottonwood Teepees, large colorful, sandstone formations resembling the so-called Indian dwellings. The route to Cottonwood Cove is about twelve miles from House Rock Valley Road and takes a little under an hour. All the side routes are clearly signed so there was little chance of getting lost. After the first easy road segment (BLM-1017), things get a bit more interesting. The remaining segments are definitely four-wheel drive and high-clearance but have been made far easier due to the damp conditions. While there were occasional rocky stretches, these roads were mainly high-centered sand. Long stretches were one narrow lane and often sunken. So a vehicle coming in the opposite direction might have made an interesting experience. However we saw no vehicles on the roads going out or coming back. [Photo, right: A typical stretch of remote secondary road accessing the Cottonwood Cove area of Coyote Buttes South. It is deep sand with a high center, very tough driving when the ground is dry. The damp conditions limited but did not eliminate slippage in the sand. We kept the four-wheel drive engaged the whole time though it was not really necessary. We never came close to getting stuck. However it would probably be quite a different story during drier times of the year. A shovel is definitely an essential piece of equipment out here. 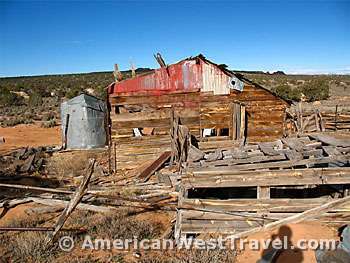 A couple of mile before reaching Cottonwood Cove, we pass through Poverty Flat where there are ruins of an old ranch worth a few minutes of exploring. The old ranch house has a number of artifacts including an ancient door-less refrigerator which still had some foodstuffs in jars. Just north of the buildings there is an old windmill worth a quick stop.